Travel, stay connected and save? You should. Without any monthly charges or roaming plans, OneSuite super-low international toll-free access rates can save you up to 90% as compared with other carriers. Here are a few tips on how to take advantage of our rates when you travel with OneSuite. 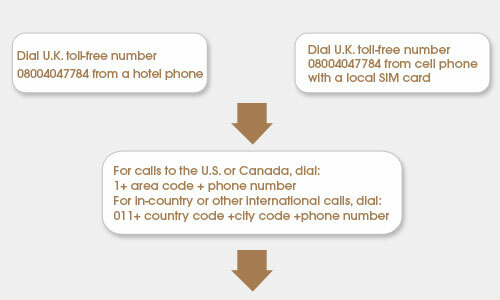 This is a sample of a savings comparison when you make calls from the U.K. Look at the decimal point…it’s not a typo!! Click here to see the complete savings comparison chart in other countries. So stop counting the minutes on the phone when you’re abroad, just dial up and talk away. Because with OneSuite, you can always stay connected anywhere in the world with less out of your pocket.